Forget the Forbidden City, food is our favorite Beijing attraction. With a whole A to Z of restaurants and dishes on offer, it can be hard to know where to start. So we have done the hard work for you and narrowed it down to a top ten list of what we feel are essential dishes (at all sorts of price points, too). Roujiamo often get referred to as “Chinese burgers” but we can’t help but feel like that kind of under-sells them. 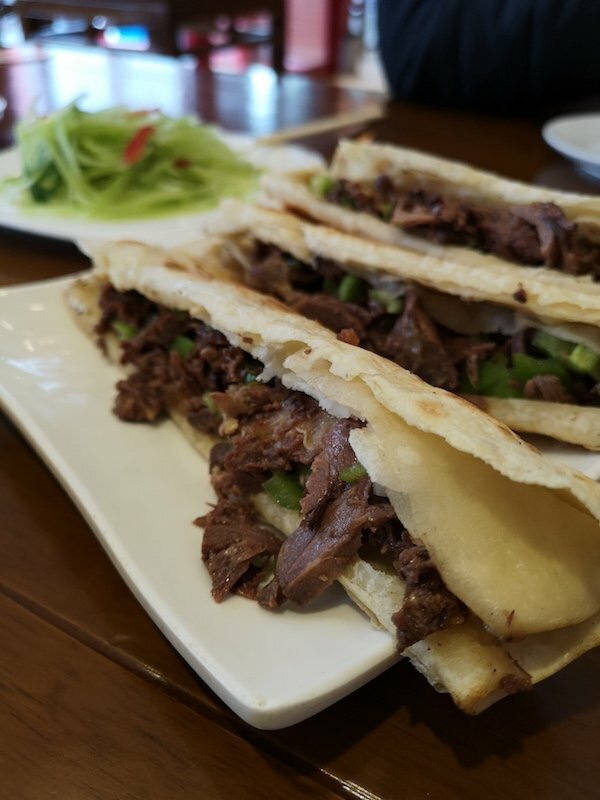 The mix of long-braised meat (usually pork in Beijing but traditionally beef or lamb) and dense baked bun is supremely satisfying (ask for added green peppers and cilantro for a vegetal upgrade). 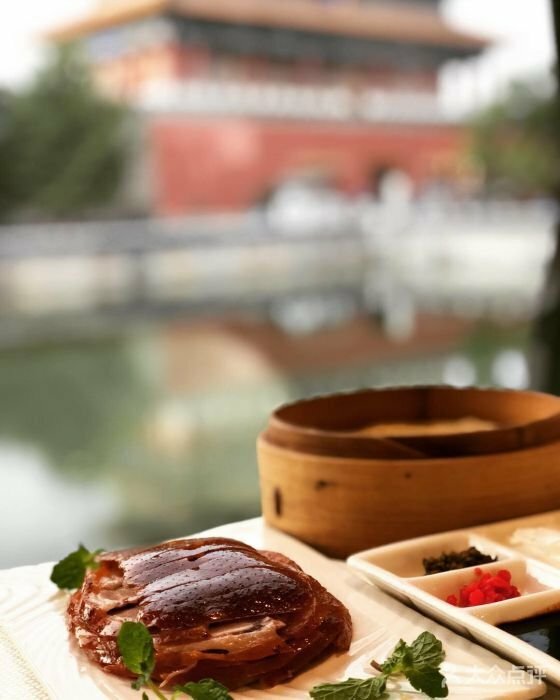 Roujiamo are often enjoyed as a cheap snack alongside a bowl of noodles, such as those at Ling Er Jiu near Chunxiu Lu, but we’re also partial to the cute miniature version served at upscale Shaanxi restaurant Zhen Ai Zhongguo. 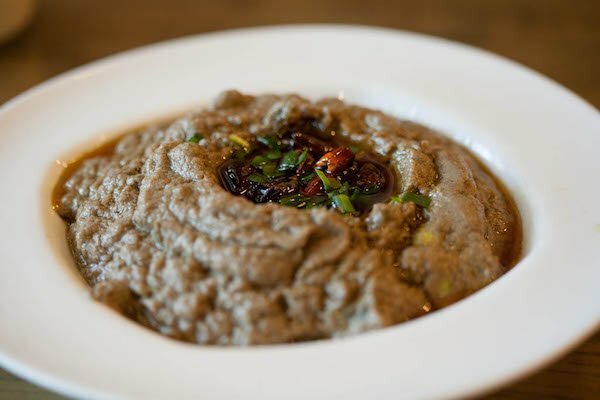 Madoufu is made from the fermented mung bean residue left by the production of douzhi – but we like to think of it as Beijing’s answer to hummus, much more palatable, right? Traditionally, the mung bean paste is stir-fried in lamb fat to remove some of the moisture and then topped with dried chilies (today, vegetarians can find versions stir-fried in vegetable oil). The sour, blue cheese-like taste takes some getting used to, but we find this is one “weird” dish we can definitely get on board with. Beijing institution Jubaoyuan in Niu Jie is famous for lamb hot pot but their madoufu also ranks among the best in the city. 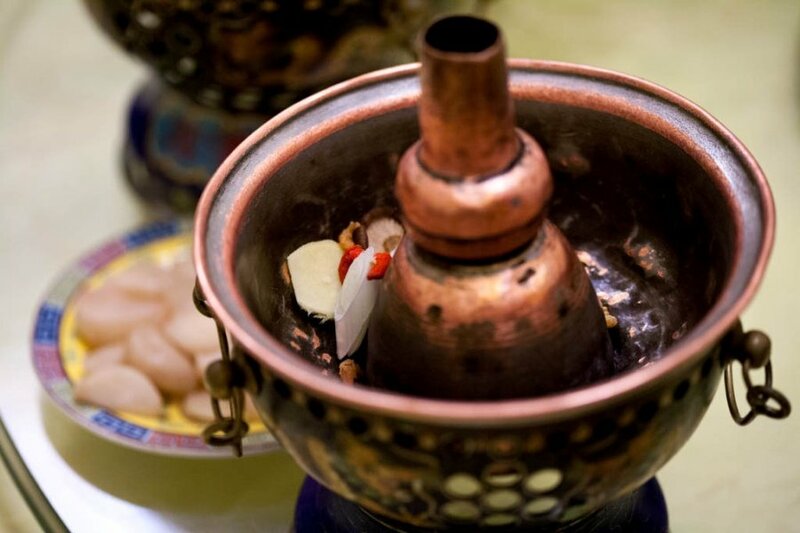 The perfect dish for winter, Beijing-style lamb hot pot (sometimes translated as Mongolian hot pot, from whence the dish originated) features a mild broth boiled in distinctive conical copper pots heated with charcoal, into which diners dip thin cuts of lamb and vegetables. Once cooked, the lamb is often dipped in sesame paste before eating. Like many other traditional Beijing dishes, the southern and western areas of the city have the highest concentration of lamb hot pot places. Time-honored brand (laozihao) Dong Lai Shun is the best place for visitors to try this dish. There are branches all over town, but we tend to go to the Wangfujing APM Mall branch, which is conveniently close to many popular hotels. Don’t stop reading at the mention of donkey: these are one of Beijing’s must-try snacks, reminiscent of corned beef stuffed in a crisp pastry-like shell (although that sells them far short). 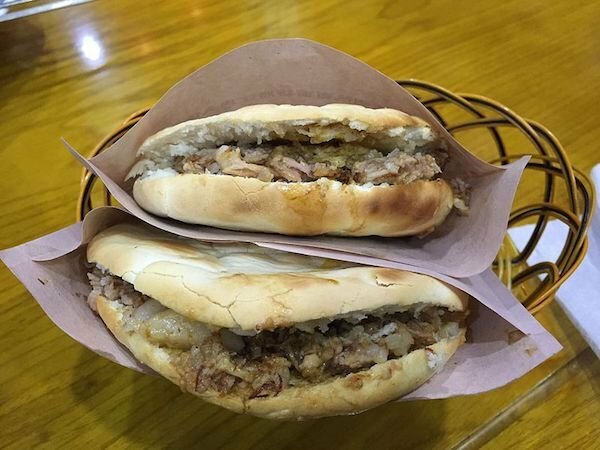 Small places selling donkey meat sandwiches can be found across the city but city-wide chain Wang Pangzi is generally considered one of the best (there are convenient branches in Gulou and Houhai if you need a quick lunch after sightseeing). Peking duck may have the star power but zhajiang noodles arguably hold a dearer place in the heart of many Beijingers. 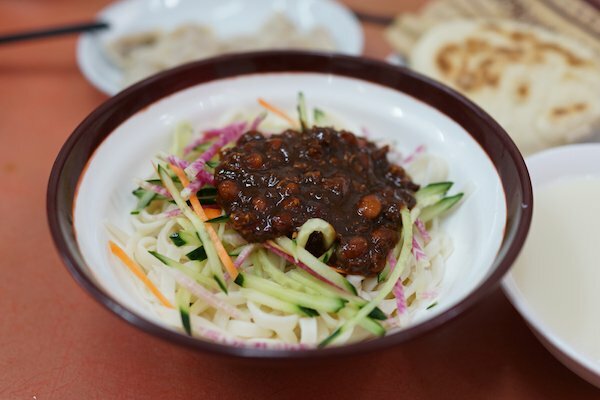 To make the dish, thick wheat noodles are mixed with strips of radish, cucumber, and other vegetables, all held together with a sauce made from diced pork belly and sweet bean paste. The name literally translates as “fried sauce noodles” but you may see it called “soybean past noodles”. Located in a small street just off the main Dahsilan’r drag, Siji Minfu Zhajiangmian attracts daily queues for their to-the-letter version of this dish. 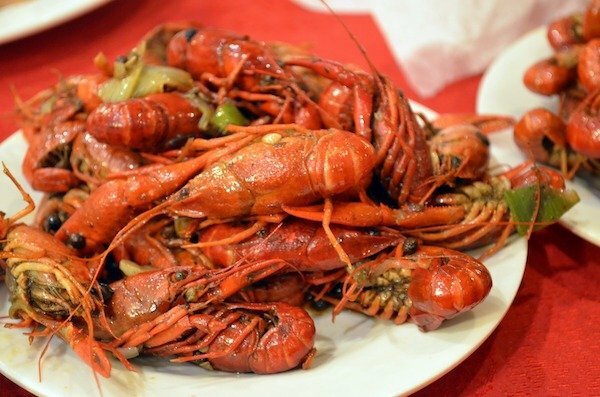 Come summer these spicy crustaceans are the hottest (pun intended) dish in Beijing. Crayfish are farmed in areas such as Hubei and Jiangsu, before being shipped up to Beijing. The current most popular preparation sees the spiny beauties cooked in a broth laced with chilies, Sichuan peppercorns, and other dried spices. Don a pair of disposable gloves and get cracking to reveal the tender meat inside the shells. Ghost Street is the most popular destination for crayfish, and mammoth restaurant Huda attracts the crowds for its lip-tingling version and other spicy dishes. Be prepared for a long wait. 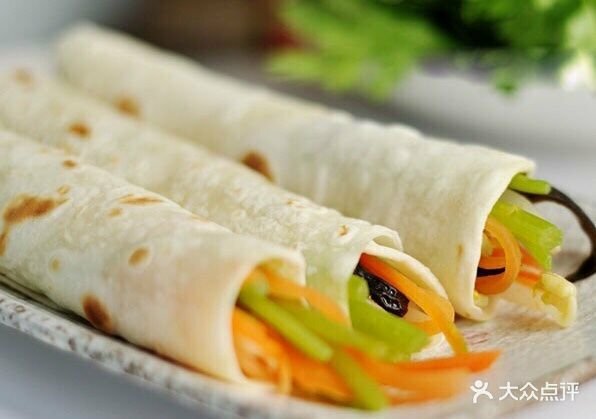 Chunbing, literally “spring pancakes,” refers to a dish of plain wheat flour wrappers (sometimes colored with spinach or carrot) that are served alongside a variety of small stir-fried dishes, which diners then wrap in the pancakes and eat (a bit like Peking duck). Chunbing are typically associated with two traditional festivals: Lichun (立春), the first solar term of the Chinese agricultural calendar, which marks the beginning of Spring, and Longtaitou (龙抬头), the second day of the second month of the Chinese calendar. Chunbing Jingweicaiis a favorite of the denizens of Beixinqiao and Yonghegong. You may associate spicy and numbing flavors with Sichuan, but Beijing diners love to splash out on spice as well. 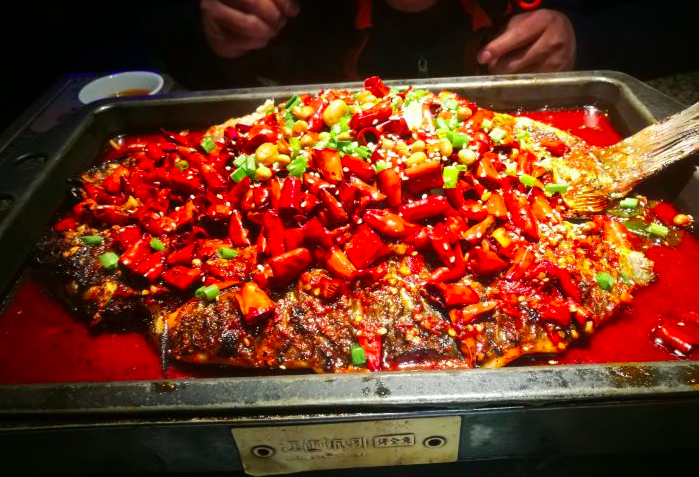 One spicy dish that has become extremely popular in recent years is kaoyu, or whole roast fish. The fish is dry-grilled and then brought to the table in a chafing dish filled with flavored oil, herbs, and spices. The real genius of this dish, however, is the hot pot-style adds ons that you can choose to add to the sauce around the sauce; we like to add sliced potato, lotus root, and tofu skin. Jiang Bian Cheng Wai (several branches around the city) is a reliable place to enjoy this dish. 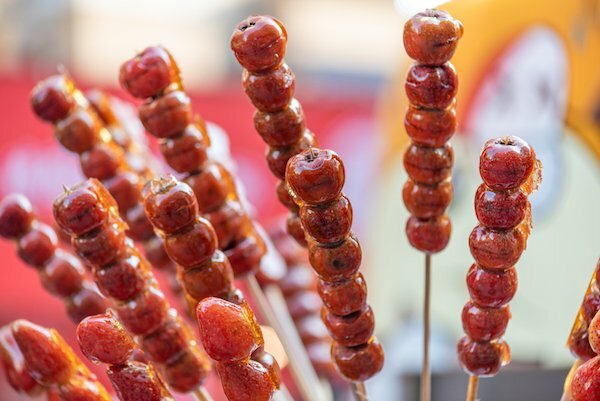 One of the most iconic Beijing street snacks, these glistening red morsels (pictured at the top) are traditionally a winter delicacy but can be found all year round. Literally meaning “rock sugar bottle gourd” (a reference to the shape), this teeth-testing sweet treat features fruit dipped in sugar syrup and threaded onto a long skewer – think of it as a Chinese candy apple. The most traditional version uses the fruits of the Chinese hawthorn, although nowadays vendors use everything from strawberries to kiwi. Try it from one of the various vendors along Yandai Xiejie, which runs from Di’anmen Waidajie towards Houhai.